Joe McKeown has accepted appointment as Port Captain for Point Edward, Ont. (H-2) which is right around the corner from Sarnia, Ont. (D-3) where he has held this same title since June of 2013. Joe came from a boating family, with his great grandfather a founding member of the Detroit Yacht Club and a long line of GLCC members. Growing up, he spent many of his childhood summers around boats (albeit of the power variety) at his family’s cottage in Amherstburg, Ont. ; learning about boats, family and the beauty of the Great Lakes. He is a licensed Coast Guard Captain and ran a charter and dive boat in the BVI for a time. His first sailboat was an Aloha 32 sailed out of Annapolis, Md. Bay, where he learned the fun of bumping from sandbar to sandbar in the shallow, tidal Chesapeake Bay. He met his wife on a blind date on that boat. Today, his family sails together out of Sarnia, with an annual trip to the North Channel. After a 20 year career at a major telecommunications company in Washington, DC, they moved back to the Great Lakes and Ann Arbor, Mich., where they currently live. Today, he runs a Marketing Company there, which allows some work-from-the-boat lifestyle. Their current boat is a Jeanneau Sun Odyssey 46 named Azure Mer, currently berthed at Bridgeview Marina in Sarnia. 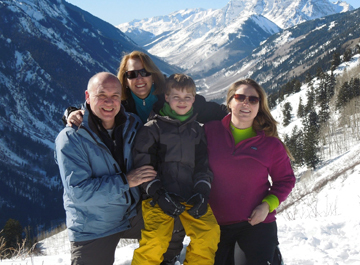 During the winters, they enjoy skiing and spending time with their Aunt (& GLCC member) Val-le and her family in Colorado. Joe encourages anyone passing through Sarnia, Point Edward, or staying at one of the four great marinas (Bridgeview, Sarnia Bay, Lake Huron Yachts or the Sarnia Yacht Club) to reach out and say hello as they pass through. If there is anything you need, please do not hesitate to ask as he will do his best to represent the Club.